WINDSOR, Ontario (21 September 2015) - As part of its ongoing 90th anniversary celebrations, Tepperman's Furniture has donated $5,000 each to local community organisations in the nearby cities of Sarnia and Chatham, where two of its four stores are located. 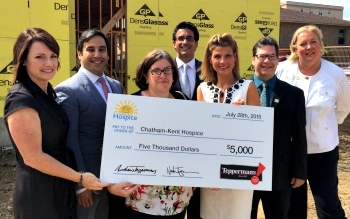 The third-generation family owned-and-operated full line furniture retailer said the team at Tepperman's Chatham - led by general manager Louisa Valihora - chose to support the Chatham-Kent Hospice with a $5,000 donation to its Hope Chest Campaign to purchase furniture and equipment for the new residential hospice. Construction is expected to be finished by the end of 2015 on the 10-bed residential hospice that will care for patients and their families and friends dealing with a terminal illness. The hospice will provide comfort, support and pain management in a home-like setting. The Tepperman's Chatham team chose Chatham-Kent Hospice for a number of reasons. Seen here at a recent cheque presentation to the Chatham-Kent Hospice are (from left to right): Jodi Maroney, the hospice's director of development; Noah Tepperman, secretary-treasurer of Tepperman's; Louisa Valihora, general manager, Tepperman's Chatham; Andrew Tepperman, president; Rhonda Bennett, furniture sales, Tepperman's Chatham; Al Morency, appliance/audio visual Sales, Tepperman's Chatham; and, Jennifer Wilson, chairperson of the Chatham-Kent Hospice Board. A few months ago, Danielle Parker, Tepperman's credit and office manager, won a company-wide award for a manager who best lives the company's mission, vision and values. She decided to donate her monetary award to Chatham-Kent Hospice. Almost every member of the Chatham team knows of a family member or friend who will be able to benefit from this caring facility. "End-of- life care is something we only have one chance to do right. The new Chatham-Kent Hospice will provide comfort, support and pain management in a dignified home-like setting," company president Andrew Tepperman said. Meanwhile, Tepperman's Sarnia - led by general manager Kevin Lecuyer and sales manager Kelly Ash - choose to support the Women's Interval Home of Sarnia Lambton with a $5,000 donation to fund programs such as Women on the Move bursaries and Children at Risk. The Tepperman's Sarnia team chose the Women's Interval Home for a number of reasons, including Ash's current role as chairperson of the board. The company noted that with government funding being cut back and the need for these types of services increasing, it's important for the private sector to help out where possible. This organization is critical to many families in the community. "We share a similar mindset as Women's Interval Home in terms of addressing the long term core issues rather than short term symptoms," Tepperman said. 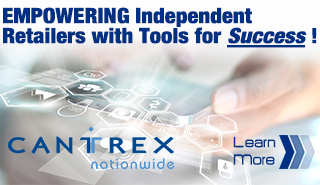 "We are very proud to develop this partnership with Women's Interval Home. Tepperman's community partnerships focus on three key areas: kids, health and education. "Both of these partnerships fit in perfectly with our community health focus," Tepperman said. "Even though our head office is located in Windsor, we challenged each one of stores in each market to choose an organization to partner with that best fit our charitable strategy of children, health and education." Earlier this year, Tepperman's Furniture donated $45,000 each to the Art Gallery of Windsor (AGW) and the London Children's Museum. This was in addition to a previously announced $30,000 scholarships and bursaries for students in south-western Ontario. With four stores in the communities of London, Windsor, Sarnia and Chatham, Tepperman's employs a total of 341 people throughout south-western Ontario.